Last week Reynolda had their Vacation Bible School. I think I saw everyone from the class there at some point. I hope that your kids enjoyed it as much as Rachel. As promised, Pastor Chris Lawson posted the closing video from the week. I think it was hard to find on the Reynolda site, so I have re-posted here for everyone to see again. Or, for the first time, if you are like Allison and could not make it. Vacation Bible School from Reynolda Church on Vimeo. We hope everyone enjoyed their break. As the heat of summer continues to rise, we are getting close to the starting back point of the POPs class. 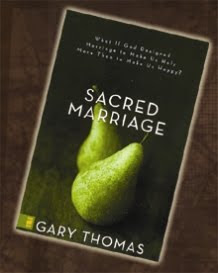 This fall we will be going through Gary Thomas' book, Sacred Marriage. We will be taking a look at our marriages and how important they to our kids. We will also be leading this class for Newly Married couples at our home during the same time. This similar class will just focus on the importance of prioritizing marriage early on and will not have childcare. Please let any of your friends who do not have kids know about the class. We are also taking new people for out class, so let the word out. You can lead them to this blog. If you are reading this and not in the class yet, please sign in so we can keep you inform you when we get close to start. I look forward to getting everyone together again in September. First of all, thank you Joyners for letting us all come to your home on Sunday. It was amazing how you kept the rain at bay for us to enjoy your backyard. We had a great time. Allison and I are planning on making as many as we can. This is great opportunity for each of us. There will be CD's available if you are helping out with the VBS. Hope to see you there.